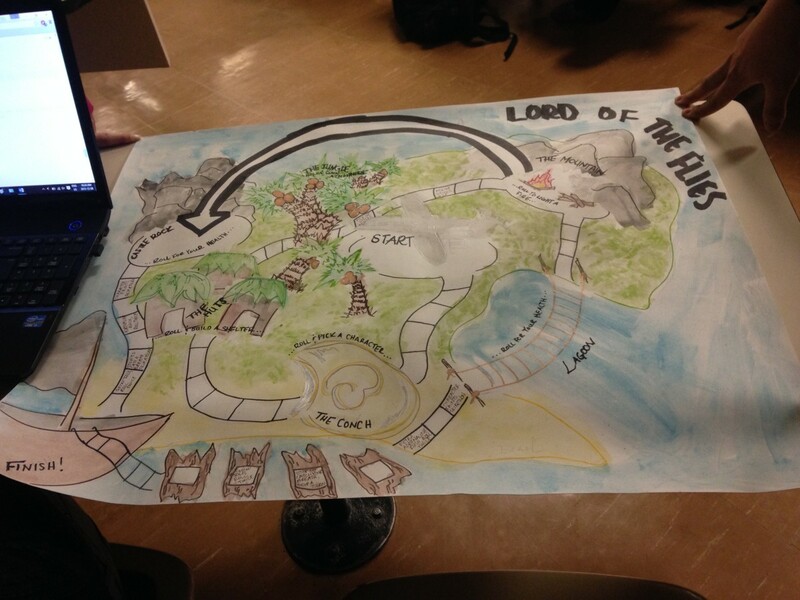 We created a board game for Lord of the Flies that focuses on making the students familiar with the settings, characters (and their dynamics), the atmosphere of the story, as well as main events that occur throughout the book. This pedagogical tool is important due to the fact that it generates interest for the storyline and motivates the students to connect with the characters within the novel. This board game is designed for Grade 11 College or University English classes, but could also be applicable for grades 10 and 12 (Applied or Academic, and Grade 12 College). Your players journey is based off of a series of high or low rolls. Throughout the board game, there are multiple points wherein the players roll will determine the success of your character. The first area is the "Conch," this is where you roll for a character. Following the conch is the "Huts," which is where your character builds a shelter. After the hut station, you will venture through the "Jungle" and your roll will access the atmosphere of your setting. The "Mountain" is next, this is where your character will attempt to make a fire. If you succeed, you fast track to "Castle Rock," if you are unsuccessful, you follow the path through the Lagoon. When you have reached these final checkpoints, you roll to access your character's health. Throughout these checkpoints you have been collecting or giving away "Life points." Whoever has the most life points at the end of the game, is the winner!